Drawing: Faces & Expressions teaches aspiring artists how to achieve realistic facial expressions and portraits in graphite pencil. Perfect for beginning artists, Drawing: Faces & Expressions offers a comprehensive introduction on how to draw faces and expressions - the most important aspects of an individual. Aspiring artists will learn everything about the tools and materials they need to get started, including selecting the right pencils, papers, and erasers for their work. Additionally, artists will discover tips for drawing and shading techniques, such as how to achieve volume, suggest depth, and render various hair and skin textures. With their new found knowledge of pencil drawing basics, artists will learn to master the art of drawing the human face through a series of helpful examples and easy-to-follow, step-by-step projects, including a child portrait, adult portrait, an elderly portrait, and other practice projects that feature different techniques for capturing expressions and rendering features, including eyes, mouth, nose, and hands. Featuring the stunning artwork of gifted artist, Diane Cardaci - a veteran Walter Foster artist ? ?this title features all new artwork designed to inspire a classical approach to rendering faces in graphite pencil. 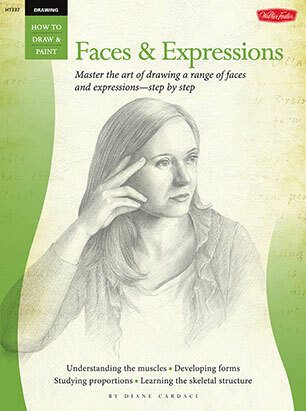 With its wide-ranging instruction, a plethora of artist tips, and beautiful artwork to inspire, Drawing: Faces & Expressions is the perfect resource for any beginning portrait artist. Diane Cardaci was classically trained at the Art Students League of New York City, Parsons School of Design, and the School of Visual Arts. Her passion for both realism and nature led her to start her professional art career working as a Natural Science Illustrator in New York City, where she specialized in medical and natural science illustrations. Her work has been published by the American Museum of Natural History in New York City, as well as by major textbook companies such as Holt, Rinehart, and Winston. After studying portraiture with such nationally acclaimed artists such as Nelson Shanks and John Sanden, commissioned portrait work soon became an important part of her artwork. She is a signature member of the American Society of Portrait Artists and has contributed writing for the organizations publications. Diane is also a member of the Colored Pencil Society of America, the Graphic Artists Guild, and the Illustrator's Partnership of America.